The content of this article provides interesting history, facts and information about the Emperor Gallienus and the all-powerful Caesars who ruled the empire of Ancient Rome. "Famine, Plague and the 'Thirty Tyrants"
Short Biography profile and facts about one of the most famous Romans of all, in the life of Gallienus, Emperor of Rome and provinces of the Roman Empire. Obtain a fast overview of the times of the Roman Emperor Gallienus from the following facts and information about his life. Why was Gallienus famous? Accomplishments, achievements and important events. Valerian the father of Gallienus seized power via a military coup. His first act as emperor was to make his son Gallienus his co-emperor. Both Gallienus and his father sought to repel the attacks of innumerable enemies on every side of the empire including the Goths, the Franks, the Scythians and the Persians. In 259AD a campaign against the Persians culminated in a humiliating Roman defeat at the Battle of Edessa. 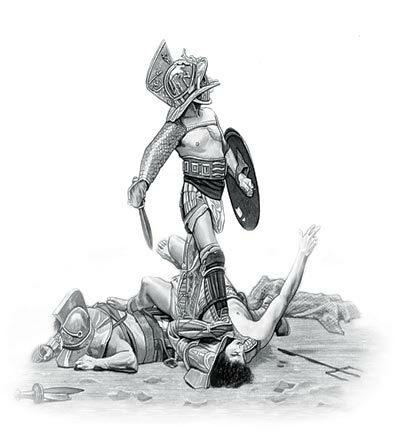 Valerian was taken prisoner and his entire 70,000 strong Roman force was killed or captured. Gallienus made no attempt to free his father and Valerian languished for nine years in captivity until his death. The Allemanni, meanwhile, had entered Italy, ravaged its northern territory and even threatened Rome. They withdrew, loaded with plunder. To gain allies among the barbarians, Gallienus married the daughter of the king of the Marcomanni. Every part of the empire was been laid open to the invaders. Greece was ravaged by the Goths; the famous Temple of Diana at Ephesus was burned by them, together with the city. Sapor, king of the Persians, overran Syria and Asia. He was, however, finally repelled by the brave Odenatus, who, with his queen Zenobia, ruled at Palmyra. A crowd of usurpers rose in arms against the weak Gallienus. There were nineteen pretenders to the throne according to Gibbon, but this period is usually known as that of the 'Thirty Tyrants'. In order to reduce the threat of usurpers Gallienus forbade senators from becoming military commanders. This policy undermined senatorial power, as more reliable military commanders rose to prominence. This terrible period was also marked by the plague, which continued for fifteen years in every province. Five thousand people died daily at Rome for some time. Roman cities were depopulated and the number of Romans declined. A famine preceded and attended the plague and earthquakes were common. Gallienus made his greatest achievements during at the end of his reign. Having lost the greater part of the Gallic empire he repelled an invasion of Goths and defeated the Alamanni. Gallienus then moved on to lay siege to Mediolanum (Milan). During the siege Gallienus' authority was challenged and Gallienus was murdered in mysterious circumstances in September 268. The death of Gallienus ended the era of the Thirty Tyrants and the Barracks emperors. Gallienus was officially succeeded by Marcus Aurelius Claudius (Claudius II), who was suspected of being involved in the conspiracy to murder Gallienus. Claudius II started the rule of the Illyrian Emperors (268 - 285). The content of this Gallienus category in the Emperors of Ancient Rome provides free educational details, facts and information for reference and research for schools, colleges and homework. Refer to the Colosseum Sitemap for a comprehensive search on interesting different categories containing the history, facts and information about the lives and people of Ancient Rome.